Afghan government and Nato forces say they are preparing to retake the southern town of Musa Qala which was overrun by the Taleban two days ago. 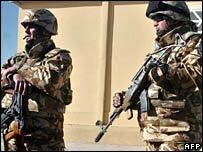 An Afghan official said "a serious attack" would be launched and a Nato commander vowed to expel the rebels. Musa Qala, in troubled Helmand province, was stormed by Taleban forces four months after UK troops pulled out following a deal with local elders. A spokesman for the Taleban said they would resist any counter-attack. "We have got enough troops here and if required, we will bring more from other locations," Yusuf Ahmadi told AFP news agency. Some local people have been leaving the town, expecting fresh fighting. Interior ministry spokesman Zemarai Bashary told reporters the authorities were "working on a plan" to take back the area. "It will be a serious attack and it will be in the very near future." The Nato-led International Security Assistance Force (Isaf) said the government's authority would be restored "at a time and manner of its (the government's) choosing" and Isaf was ready to assist. "The Taleban have previously taken district centres for short periods for propaganda purposes. They are unable to hold them," the force said in a statement. The British general who leads Isaf in southern Afghanistan, Gen David Richards, said: "We will put the tribal elders back in control of Musa Qala and we will kick the Taleban out." The British military, which has the bulk of its troops in Helmand, withdrew from Musa Qala in October, after tribal leaders agreed to ensure that Taleban fighters would stay away. But US commanders and diplomats criticised the agreement at the time. They said it had not been done with local elders but with the Taleban themselves and was not the way to defeat them. In 2006, Helmand province saw some of the fiercest fighting in the Taleban-led insurgency.